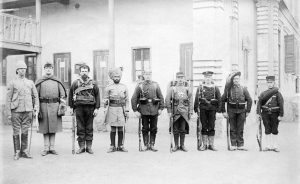 The Eight Nation Alliance consisted of the United States, British Empire, Germany, France, Austro-Hungary, Italy, Russia, and Japan. These rivals temporarily put aside their competition to defeat a threat to all of their interests. Each nation had adopted different standard issue rifles for their armies, and the weapons their soldiers carried were a showcase of available small arms technology. Their temporary friendship was tenuous at best. By the end of the Boxer Uprising each nation within the coalition was accusing all the others of poor performance, atrocities, and looting. By 1914 these same rifles outfitted their armies for one of the most devastating wars in history. Troops of the Eight Nation Alliance assembled in Peking. Although the rifles are difficult to distinguish, an Austro-Hungarian soldier’s Mannlicher 1888 is visible, with a distinctive gap between the trigger guard and magazine. During the summer of 1900, eight major powers assembled a military coalition to protect their influence in China. The Boxer Rebellion was a Chinese movement that had formed in response to growing foreign power in China. The Boxers wanted to end outside influence and began to attack westerners. In June, 1900 Boxers besieged the Legation Quarter of Peking, modern Beijing. They trapped a large number of foreigners and Chinese nationals inside. The Chinese government threw its support behind the Boxer rebellion, and declared war on the foreign coalition. 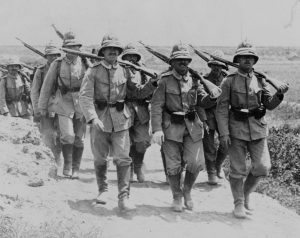 The Allies sent a relief expedition to relieve the siege on June 10th, but it was beaten back after encountering heavy resistance. On August 4th the Allies launched a much stronger relief expedition that was able to break the siege and force and end to the short, but violent, war. 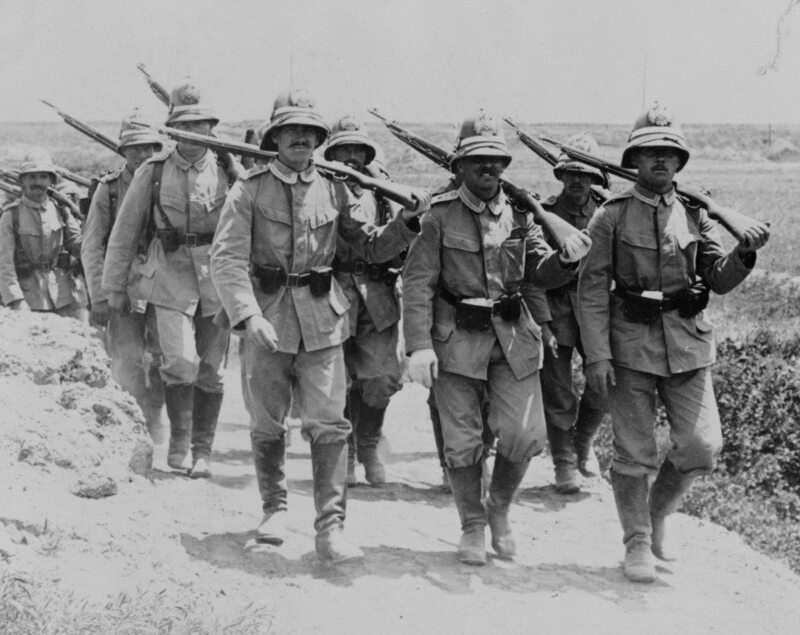 German soldiers march with their Gewehr 98s near Peking. The invention of smokeless powder in the 1880s in France had ushered in a new race between the major powers to update their arsenals. France went first, in 1886 they adopted the Lebel, and the trend was set. By the time of the Eight Nation Alliance, the powers brought together a slew of rifles that had been competing with one another for military contracts on both sides of the Atlantic. Prior to adopting the Krag-Jorgensen in 1892, the U.S. Army had tested over 50 designs. 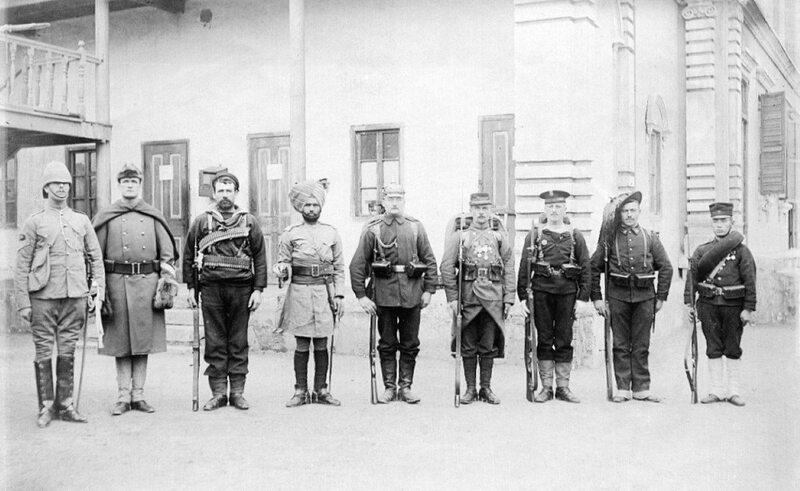 French soldiers carried their Lebel rifles into Peking. German troops brought the new 1898 Mauser. Austro-Hungarian soldiers marched with 1888 Mannlicher rifles, updated in 1890 to a new cartridge. Italians had their Model 1891 Carcano. the Japanese fought with a mixture of their new Type 30 Arisakas and older Murata rifles. The Russians, who would go to war with Japan in 1905, used the M91 Mosin-Nagant. Troops from around the British Empire were armed with the new magazine Lee-Enfield, and its predecessor the Lee-Metford. Soldiers from the U.S. Army were equipped with Krag-Jorgensens, while U.S. Marines were armed with Lee 1895 rifles. The various rifles utilized a number of different features. The Mausers, Mosins, and Arisakas could be reloaded quickly with 5 round stripper clips. The Lebel’s tube magazine, and the Krag-Jorgensen’s side loading gate could not accept stripper or en-bloc clips, and the British only updated the Enfield to take chargers later. The Mannlicher and the Lee-Metford both began as black powder designs, while the Murata was a hold-over from single-shot days. Some of the rifles present became the most iconic bolt action designs in history. The Lee-Enfield, Mosin-Nagant, and Mauser and their variants all had more than 10 million examples produced over their lifespan. The American Lee 1895 and Krag-Jorgsensen were both about to be replaced by the 1903 Springfield. The designers of these rifles and the men that carried them could not foresee the lasting impact they would have on firearms technology and the rest of the 20th Century. The Cody Firearms Museum holds examples of a number of these rifles in our collection including a Lee 1895, M91 Mosin-Nagant, Lebel, 1888 Mannlicher, Krag-Jorgensen, and even a Japanese Murata. Danny Michael works as the Assistant Curator of the Cody Firearms Museum. In addition to assisting with visitor inquires, researching, and writing about the collection, he also manages social media content for the Cody Firearms Museum. Danny recently moved from Maryland and enjoys finding ways to watch the Baltimore Orioles from Wyoming, recreational shooting, and reading about history.